It starts with a dream to experience a part of the globe your feet have yet to walk on, a desire to meet new people, understand different perspectives and see places beyond your imagination. With a little planning and a lot of excitement a trip is born. 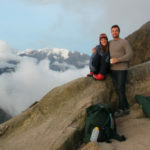 Daniel and Stephanie’s trip started with an idea just like this and ended with them catching their breath and gazing in amazement at Machu Picchu. Daniel and Stephanie Joseph took time to reflect after their trip to Peru, in the form of a modern day e-mail no less, and they were kind enough to share their thoughts with us (and we are so thankful for that, because reading messages like this is truly what makes us love our job)! 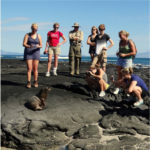 I have a little time so I wanted to give you guys a little more specific feedback on our trip which we absolutely loved. The level of service from all of your team was beyond our expectations, top notch and spot on. Everyone was extremely courteous, friendly, interested and enthusiastic. The weather turned out fine but I have to say it was a little stressful when we got to the guardhouse at [Machu Picchu] at 7:30am and couldn’t see 10 feet in front of our face! It started clearing around 9:00am and was beautiful by the time we got to the top of Huyanupicchu by 11:00am. Smart to do the 10:00am group as I am sure the 7:00am folks got fogged out! Overall, weather in the Sacred Valley was beautiful. 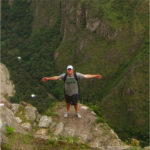 We had one cold and rainy day in Cusco but we were mostly doing inside touring that day anyhow. Was a little stressful seeing terrible forecast on Weather.com the week before though! We spent 7 days with our guide Felix Portilla and every day was better than the next. He has an amazing amount of pride and enthusiasm for his profession and the Incan culture. Felix made us feel comfortable from the start and kept us involved in the discussion. He added some things that weren’t even on our itinerary such as the Pisac Ruins and he even took Stephanie and I to visit his mom at a Cusco pre-school to see her students in action. Stephanie is a pre-school director in Atlanta and this may have been the highlight of her trip, even better than Machu Picchu! We had Mario as a driver most days and he was very kind and made us feel safe. He even took pictures of us with his camera for his memories which we thought was very touching. Percy was our driver on Sunday and did great as well. The mountain bike experience with Yuri and Elvis (Presley) was fantastic and perfect for our abilities. The gourmet picnic lunch overlooking the Andes was out of this world. Steph [opted out of] the downhill after lunch, so me and the two guys barreled downhill for about 40 min which was a highlight for me. I have to say that that part of the ride is fast and a little technical and not for the faint of heart so might want to inform folks about that, but I thought it was great and the guys were careful to assess my abilities first. 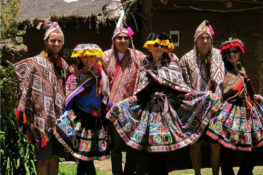 The Amaru Village was special and the locals of that community were so nice. It was amazing for us to have a private experience in a place like that! What a cultural experience for us! Also, the lunch at the Huaynu Hacienda was beautiful and probably one of the better meals on the trip and it was a nice refreshing break. Felix also took us to Chinchero for a tour of the town and church which was an unexpected surprise. The cooking class in Cusco was also a highlight. Alvaro was a cool, laidback guy but very knowledgeable about the local foods, herbs, spices and remedies. The trip to San Pedro market was a trip and the set-up at the kitchen on top of the hill was great. The food was delicious and expertly prepared – by us! Great experience overall. I saw Renee’s name in the guest book there so I am sure she knows all about it. Nice choice as I know there are other cooking classes in Cusco but this one was certainly special. 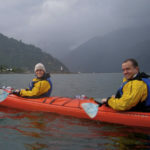 I usually like to plan trips myself and enjoy the adventure but I am so glad that we did a tour for our Peru trip as it really made it special and wouldn’t have been nearly the same on our own. I have to say I was a little hesitant at first using Knowmad as the only recommendation was from the Money Magazine article. Renee made me feel very comfortable from the start and my instinct said to go with it and Stephanie and I couldn’t have been happier. Thanks to her and Knowmad for creating this special memory for us. We will definitely tell all of our friends about you and hope to do Ecuador and/or Chile sometime soon. Thank you so much for the recap Dan and Stephanie, we had such a fun time working with you both. 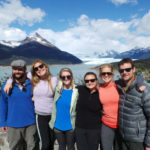 Read on to see their detailed Peru travel itinerary. You will be met in your hotel lobby at 7:15 a.m. and assisted in crossing the street and checking in for your flight. After your short morning flight to the former Incan capital of Cusco where Andean cultures come alive (don’t be surprised when the language doesn’t sound like Spanish – it is most likely the native Andean tongue Quechua), you’ll be met at the airport and taken for lunch. Departing for the Incan sights outside Cusco, you’ll visit the fortress Sacsayhuaman and its megalithic stone terraces; Kenko, with its carved stone surfaces and subterranean altars; the Puka Pukara fortress that protected the royal capital from attacks; and the water temple, Tambo Machay. Departing in the morning, drive up the mountains towards Cruzpata where your adventure begins. Non-technical and mostly downhill, this world-class mountain biking adventure is great for those with and without experience alike. Traversing the altiplano landscape with sweeping vistas to snowcapped peaks over 16,000 feet high, you arrive to Moray – a little-known site thought to be an ancient Incan agricultural laboratory. From here you begin descending and pass through a traditional colonial village. After enjoying! a gourmet picnic lunch in the shadows of the Andes, continue on the downhill section to Maras where villagers still harvest the pre-Colombian terraced saltpans in the traditional way. Walk down the Andes to the valley floor where you board the Vistadome train that chugs along the Urubamba River and parts of the Inca Trail towards the Amazon arriving at Machu Picchu Pueblo. You will be picked up at your hotel at 10:00 a.m. and taken to the historic San Pedro Mercado. This authentic food market is the place of choice for local Cuzqueno people to do their grocery shopping, and filled with a cacophony of sounds, vibrant colors, and pungent aromas. Explore the market alongside your chef guide learning about Peru’s diverse cuisine and ingredients while getting a real dose of Peruvian culture and meeting some of the chef’s favorite local providers. From here you’ll be taken to the chef’s beautiful open-air cooking laboratory in the countryside just above Cusco where you’ll tour the garden sipping a delicious pisco sour before the cooking instruction begins. After your interactive cooking lesson and a delicious lunch you’ll be taken back to your Cusco hotel. 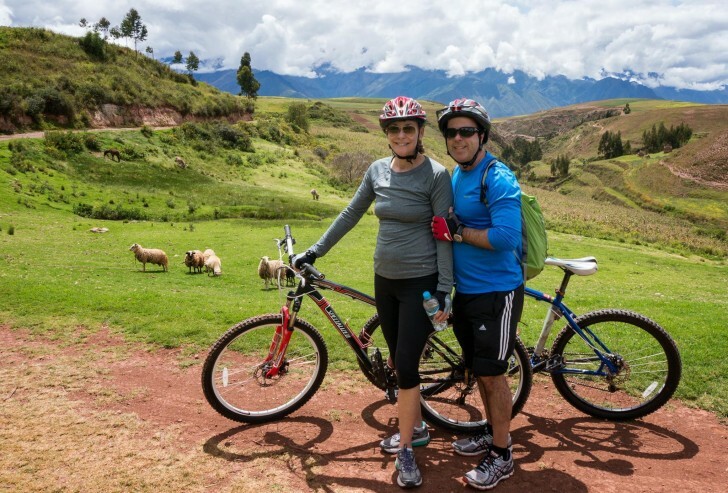 Enjoy the morning at leisure to continue exploring Cusco. You will be picked up at your hotel at 2:55 p.m. and transferred to the airport in accordance with your onward flight to Lima. After arriving in the Lima airport you will be responsible for checking in and catching your international flight. This is often a long & unavoidable layover, so save a few pages in your book or enjoy dinner across the street at Ramada’s restaurant and then fly out.